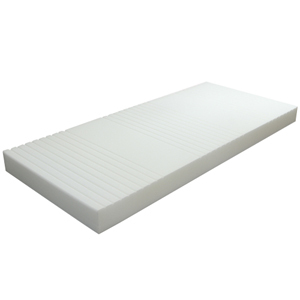 The Protekt™ 100 pressure redistribution foam mattress is specifically designed for value-oriented facilities with limited budgets. The three zones are comprised of 670 individual cells that are independent from one another. This design enables the mattress to conform to the patient's body and customize support as the patient moves. Excellent pressure redistribution is achieved by varying cell depths throughout the mattress. Special attention is given to the vulnerable heel section to decrease interface pressure. Top Cover: Anti-microbial and anti-fungal; low moisture vapor transmission (MVTR); fluid resistant; conforms to NFPA702 class 1 and TB 117E. 360 degree zipper allows for easy removal for cleaning or replacement. Side Rails: PTSS Rail System: (Patient transfer support system) Provides firm support for safe and easy patient egress and ingress from bed. Anti-Contamination Flap: This flap covers the zipper reducing the possibility of contaminating the foam core. Bottom Cover: Triple laminate vinyl; fluid resistant; anti-microbial/anti-bacterial; fire retardant. Fire Retardant: Conforms to 16 CFR Part 1632 and 1633 and NFPA 702 Class 1.